Before sliding into a magnetic resonance imaging (MRI) machine, patients are supposed to remove all metal from their bodies: underwire, jewelry, piercings, everything. The machines work using extremely strong magnets, and there are all kinds of horror stories of people leaving metal in their skin or on their body, to disastrous effects. But it’s not just piercings and jewelry people should be worried about, it turns out that some tattoos might actually become a problem during an MRI scan. Needless to say, tattoos are rapidly increasing in popularity. It is said that more than 38% of young people between the age of 19 to 28 have at least one tattoo needled to their body. Yet, examining tattooed people via MRI could possibly be risky. The first prospective study with statistically verifiable numbers has now been presented by a research team led by Nikolaus Weiskopf in the prestigious New England Journal of Medicine. Why Tattoos and MRI are not a Pleasant Combination? His former colleague in London, Martina Callaghan, completed the study after Weiskopf left London to become a director at the MPI CBS in Leipzig. “Based on our investigations, we can now state, on the basis of meaningful numbers, that if a tattooed individual is scanned under the conditions tested in the study, the risk of side effects is very small,” the physicist explains. Millions of people with tattoos are scanned every year in hospitals and research facilities without any side effects. Until now, there has not been a systematic prospective study on how safe it is to scan tattooed patients in an MRI scanner. Reports of adverse reactions are usually based on individual cases and describe two reactions. It is possible that the pigments in tattoos can interact with the static magnetic field of the scanner if the ink contains ferrous particles. The strong magnetic fields involved in the procedure can interact with these small particles, which in turn can lead to a pulling sensation on the tattooed skin. However, another potential interaction may represent a far greater risk, according to the researchers. Many color pigments are conductive. This is an issue because in MR imaging uses high-frequency magnetic fields to generate the images by effectively labeling protons. “High-frequency fields usually have a frequency of a few hundred megahertz. That happens to correspond to the resonance lengths of conductive structures similarly sized as tattoos. In this case, the tattoo may absorb much of the energy of the high-frequency field, which would normally be spread out more widely. The tattoo then heats up. In the worst case, this can lead to burns,” says Nikolaus Weiskopf. 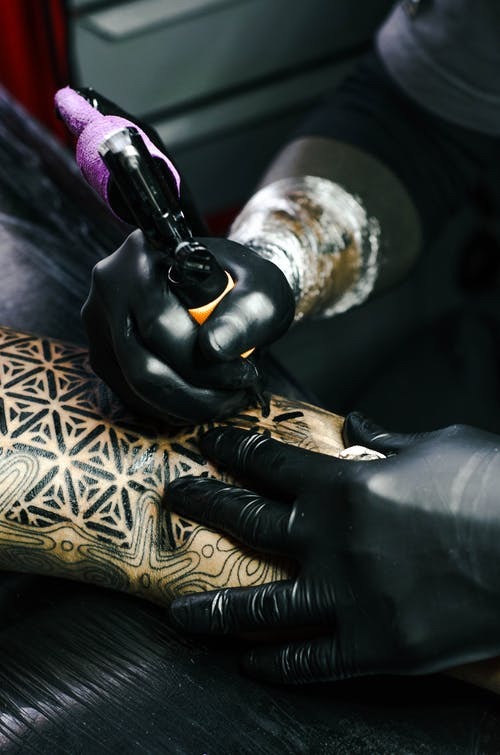 If this is the case, heated up particles of the tattoo would then create either a skin irritation or even first-degree burns that would not stop spreading unless the scan is stopped. Together with his colleagues at University College in London, he examined 330 study participants before and after MRI scans and tested a total of 932 tattoos. The team systematically collected information about participants’ tattoos—how big they were, where they were located, and what colors were used. Patient countries of origin were in Europe, America, Asia, Africa and Australia. The majority of the tattoos were black ink, but many colors were also registered. In order to ensure the participants’ safety from potential burns, they were carefully vetted—exclusion criteria concerned the size and number of tattoos. For example, a single tattoo was not allowed to exceed 20 centimeters and no more than 5 percent of the body could be covered by tattoos. The MRI scanners used in the study had a static magnetic field strength of three Tesla, as is common in many clinics today. By comparison, the magnetic field of a weak 0.5 Tesla MRI model is 10,000 times stronger than the Earth’s magnetic field. These MRI scanners usually have a radio-frequency body coil, which stimulates the proton spins for imaging. The high-frequency field of a body coil extends not only over the head, as in this study, but also the upper body area of the participants, and thus on frequently tattooed areas. According to Nikolaus Weiskopf, the results of the study not only provide information on safety guidelines for research but can definitely be helpful for clinical environments. The existing recommendations on how to scan people with tattoos are always based on weighing the risk against the actual benefit of diagnosing a disease. The main general question on whether or not should tattoos be considered safe for MRI scan is still left widely unanswered. Nevertheless, it should be noted that the results are limited to specific configurations and scanner types, this study adds to the positive safety record of MRI. The chances of having an adverse reaction are low, and if your doctor thinks you need an MRI, you should probably get one. In addition, to prevent such horrible accidents from happening to patients, many MRI technologists have started using MRI accessories such as the Safety and Motion Monitoring System (SAMM System) as a solution. The SAMM System allows the MRI operator to clearly monitor patients in full-HD quality. Sound Imaging is your one-stop shop for all MRI accessories that proved to increase patients’ comfort level while reducing the possibility of costly re-scan. Please, feel free to visit our website to check all our products and accessories including the MRI Visors, MRI Stereo, SAMM MD, and Bi-Directional. Materials provided by Max Planck Institute for Human Cognitive and Brain Sciences. A.I for a Faster Scan Time?